A community event that not only brings local people and local businesses together, gives families a brilliant fun day but also supports 2 amazing charities – Help the Heroes and Air Ambulance – why would you want to be anywhere else?? Five Months ago Dan and Charlene took on ownership of The Yorkshire Rose, alongside their staff they have been renovating the pub and connecting with their local community through various activities and events. Their fun day will be the highlight of their summer events with a mixture of stalls including The Scents Room, Handmade at Holme with Love Cards, Help the Heroes, Yorkshire Air Ambulance, Police and even a Fire Engine there, will be so much to see and do you do not want to miss it. With so many more still being donated. A live DJ will be accompanying the sounds of the day providing a mixture of music to suit all tastes and keep the party going. 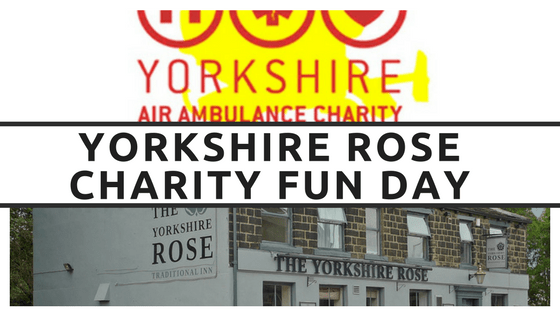 With so much to see and do on the day, The Yorkshire Rose hope they can raise £3000 to donate towards Help the Heroes and Yorkshire Air Ambulance while also bringing the community together. If you are a business owner and would like a stall do get in touch, with 2 car parks and the beer garden there is plenty of room for more stalls. Other events that Dan and Charlene run at the Pub are weekly meat raffles – supported by local butchers, free pool on a Wednesday, disco and Karaoke every Friday and Sunday night as well as regular live band events. They want to get involved with the community as much as possible being fellow Guiseley residents themselves while also supporting worthwhile charities.